Pupil and assistant May 1794 - September 1808. From the Soane office Day Book. The fringed and draped curtains supported by four ornamented vertical poles in front of the large window and the two small circular windows give a dramatic finish to the saloon. 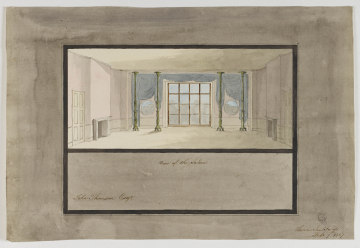 It is unusual to have Soane (or his office) making designs for hangings. Under 'Drapery' P.Lewis and G.Darley( Dictionary of Ornament, 1986, p.111) explain that 'In early 19th century France and England, ... drapery became immensely fasionable in interior decoration, possibly prompted by the developments of machinery to weave fabric of much greater width: ceilings and beds were draped like tents, sofas were crowned with hanging fabric, window curtains were extraordinarily elaborate'.